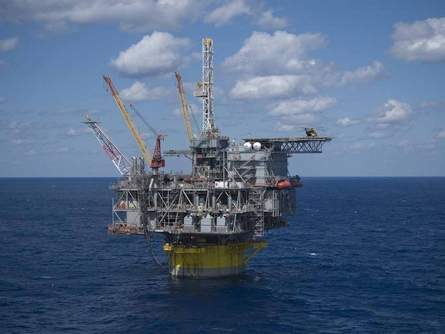 A well in the Gulf of Mexico has set a global record for oil production in deep water, Shell Oil Co. says. Shell said Thursday that it is producing oil from a well 9,627 feet below the surface of the Gulf, a depth more than six times greater than the Empire State Building’s height. It exceeds by 271 feet the depth of the previous record-holder, also a Shell project in the Gulf. Both wells operate through the Perdido drilling and production platform, 200 miles southwest of Houston. The new record-holder is in the Tobago Field, which Shell jointly owns with Chevron and Nexen, according to the company. The previous record-holding well was in the Silvertip field. The Perdido platform is moored in 8,000 feet of water, which the company says makes it the world’s deepest-water drilling and production platform. The company did not say how much the new well is producing, but said the daily capacity of the platform is 100,000 barrels of oil and 200 million cubic feet of natural gas. The Tobago Field well is several miles away from the platform, and the oil flow must follow an incline along the sea floor before being pumped vertically to the platform, Shell spokesman Jaryl Strong said. Besides the water’s depth, the project posed a challenge because of the reservoir’s low pressure, which necessitated special technology to push the oil nearly two miles up to the platform on the water’s surface. Shell noted that it did not have the technological ability to produce oil at such depths in 1996 when it purchased the lease where Perdido operates. Engineers developed a system of electrical pumps embedded in the seabed that help ship the oil to the surface platform, Strong said. Equipment in the pro-ject included FMC Technologies’ enhanced vertical deep-water tree system and the five electrical pumps that help push the oil to surface, that Houston-based company said. Shell is majority owner of the Perdido platform. BP and Chevron also have investment shares. Perdido serves wells up to seven miles away, Shell said. The company began development drilling in 2007 and oil and gas was first produced in 2010. Don Van Nieuwenhuise, director of petroleum geoscience programs at the University of Houston, said the achievement has global implications. ”They’ve brought that water depth into the realm of being technologically and economically viable,” Van Nieuwenhuise said. He noted, however, that the industry is pushing into depths that challenge existing emergency well control systems. Well control equipment developed in the wake of last year’s disastrous Gulf oil spill are designed for use in up to 10,000 feet of water. ”They are getting real close to the limit of what we can do safely,” Van Nieuwenhuise said. Strong said Shell has addressed the risks of producing oil in deep-water conditions.